Before reading even one more word, begin playing a song that calms your psyche and rouses your soul. Step away from your computer into the part of the room where you won’t crack your head when you fall. Now spin. Spin until your eyes fall back into your head and bile forms in the back of your throat. Spin until your face turns green. Spin until you lose consciousness. Better? Now consider the Mevlevi Brotherhood, more famously known as “The Whirling Dervishes,” who believe that closeness with one’s gods is achieved by elaborate whirling. They also twirl. And at certain moments, you might see something suspiciously like a spin. It’s the whirling that gets you, though. Much is made of Istanbul’s physical/cultural/spiritual position as the Earth’s definitive crossroads. When you begin, for instance, at the Beyoglu end of Istiklal Caddesi—arguably the busiest pedestrian street in the world—you are still in a Europe teeming with old cafés and modern art galleries, pocked by all the obvious global brands. But towards the minaret-riddled Golden Horn side, Caddesi dissipates into a maze of hazy side lanes; one becomes an underground tunnel, where the world’s second oldest metro creaks down a steep hill, beneath mosques and ancient baths, to the Galata bridge where old men fish for sardines and drink thick coffee and smoke nargile and hatch wondrous plots over the Golden Horn. 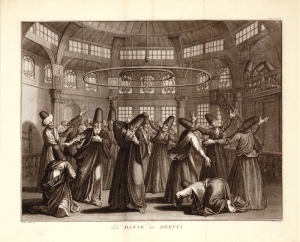 A Sufi ritual dance to forget the present by a constant spiraling movement to chants and the music of the ney (Turkish Flute). 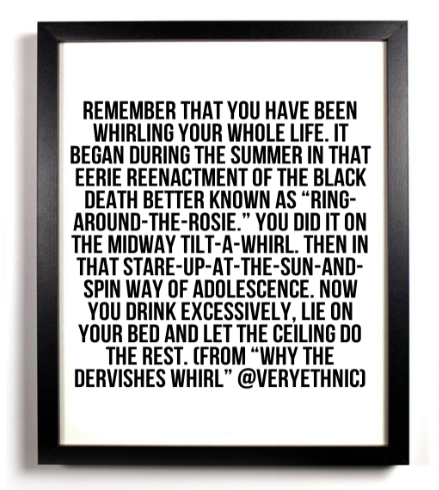 1) Remember that you have been whirling your whole life. It began during the summer in that eerie reenactment of the Black Death better known as “Ring-Around-the-Rosie.” You did it on the midway Tilt-a-Whirl. Then in that stare-up-at-the-sun-and-spin way of adolescence. Now you drink excessively, lie on your bed and let the ceiling do the rest. The lesson is: there is divinity in whirling. It is one of the great unmitigated human activities, like picking Himalayan flowers and humming Raffi songs. 2) It began simply for the 13th century mystic poet Mevlana Celaleddin Rumi. He had been walking towards a goldsmith, but came away dancing to the melodic sound of a hammer. It was (yes) a whirling dance, and Rumi grew dizzy. So dizzy that he entered a trance. He became ecstatic. The sound of the gold had left, and god was felt. Since then, the Dervishes have whirled. The lesson is that when you listen, you will her music everywhere. 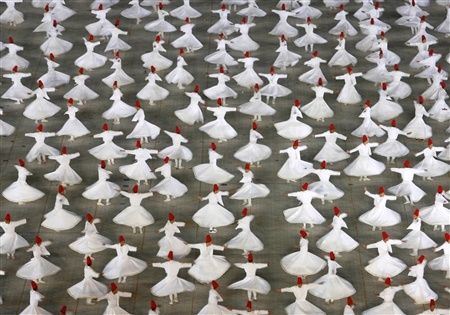 Ritual of the Whirling Dervishes at Konya. 3) For seven centuries, the practice of spinning gained popularity across Cappadocia. It was banned under Atatürk in 1925. It has been banned ever since. However, as Turkey has become a paradoxically permissive state—and more importantly because the Dervishes aren’t bad for tourism—Sufi mysticism has begun to thrive again, unofficially on the second and last Sunday of each month. You can go and can actually see their spinning with your own eyes. The lesson: sometimes we learn more by watching than doing. The sema at Whirling Dervish Hall is one of Istanbul’s hottest tickets. The ceremony begins with all the fanfare of a second hand hitting 12 on an old man’s pocket watch. Measured pacing, counterclockwise around an octagonal ring. It unfolds after that with equal inevitability. Without commotion, one semazen after the other ticks towards the wooden circle’s invisible six, before inching inwards to the ringleader (sheikh), who systematically launches each member into a distorted twirl, right hand turned upward ahead of the gaze to the gigantic chandelier overhead, the orchestra suddenly above them; reed flutes and lutes tempering the menace of kettle drums and cymbals with a Camelot court gentleness. The lesson is: do not rush in the beginning. 5) But hot damn, we are whirling now. The first thing that strikes you is how earnest and austere each Dervish whirls. It is so precise, so precious, so intimate that watching feels voyeuristic, and it’s only after the audience becomes comfortable with this intimacy that a tranquility takes over, so deep that when you find your own gaze wandering from the sema to the spectators in Dervish Hall, you will will notice that more than half are sleeping. 6) “Whatever you are,” wrote Rumi, “whether you are infidel, idolater or fireworshipper, you have broken your vows of repentance a hundred times. This is not the gate of despair, this is the gate of hope. Come, come again…” The lesson is: come. And come again. 7) By the time all 15 semazens in the ceremony are in simultaneous whir, you are struck by a sense that they are whirling away from as much as whirling towards something particular. As the cycle ends and begins again, four times in total, the whirling seems not to be “powered” by anything of this world. Like a record whose power source has been unplugged, yet still somehow it spins. One foot is firmly on an axis, the other crosses over and over with the drumming, which has now gone inside the whirler like a mantra. Except for the sweat dribbling down each semazen’s brow, the action is so perfect and effortless that you forget you’re watching human beings. 9) These faces melt into relief as the final cycle eases, and each semazen hugs him and herself, as if for dear life. Some quiet moments pass, and they pace away, leaving us with more a sense of having seen an hourglass expire than the pocket watch we first conceived, the one we imagine to tick through all the history of Istanbul. There is divinity, not necessarily in dizziness, but maybe just in looking up and rotating faster than the earth, and reaffirming that no matter how hard we try, we cannot will the sky to cave in. 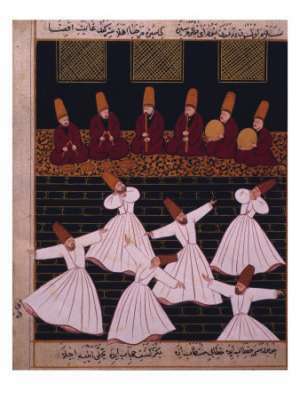 I wanted to see the foot steps of the Sufi dancer, I got it, I may show to International audience, since, I have a presentation on Rumi-painting-paper, i may just show the step to make delegates understand(Already I saw dance of turkey performers in my country). I just wanted to know the steps, I am not a dancer. Spending the summer with dervishes. do they spin clockwise or counter clockwise? Which hemisphere of the Earth are you in? Hi, where can I download Sama by Carter Williams? I am mesmerised by the track. Soundcloud can be a good source for these types of tracks. My name is Eden, I am from Istanbul. 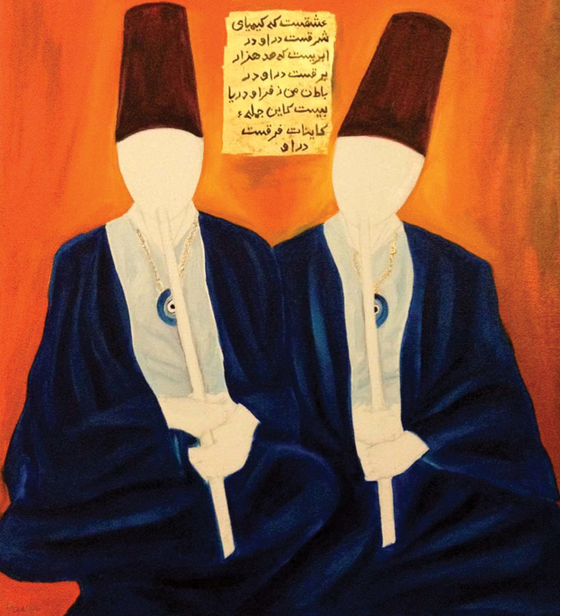 Read your story about dervishes, very beautiful. Are you in Istanbul currently? Thank you, Eden. Am not currently in Istanbul, but hope to make it back one day. One of my favourite cities in the world. Great article! Where did you find that first image?